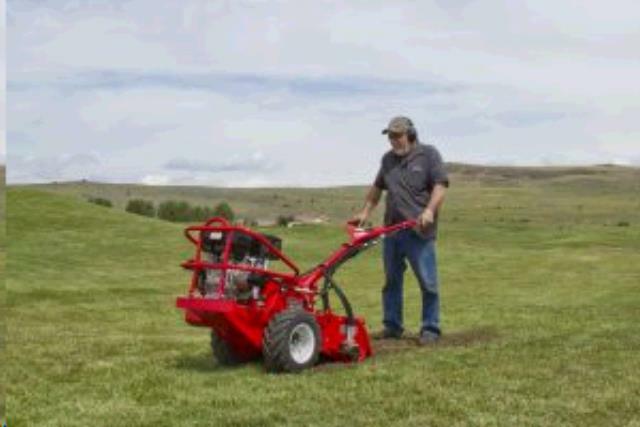 BARRETO TILLER 13HP REAR TINE Rentals Ft. Collins CO, Where to Rent BARRETO TILLER 13HP REAR TINE in Ft. Collins, Wellington, Greeley, LaPorte, Loveland, Windsor CO and all of Northern Colorado. Heavy Duty, Hydraulic driven self propelled tiller with reversable tines. Trailer included in rental charge, 2" ball required . Weight 499 lbs. 21" Tilling width, 23" Overall width. Will till 6-10 inches deep, 3-5 inches each pass. depending on conditions. Adjust the variable speed wheel drive slower for better & deeper tilling. * Please call us for any questions on our barreto tiller 13hp rear tine rentals in Fort Collins, Wellington, Greeley, LaPorte, Loveland, Windsor CO and all of Northern Colorado.